Carved trees have been scarred by Aboriginal people for various purposes, from cutting out bark for a canoe to spiritual purposes. Very few carved trees remain today. They are said to be a history book and represent Aboriginal people's soul. Scarred trees were used to create tools for everyday life. Carved trees were used as markers for sites of special significance. Aboriginal scarred tree. Today scarred trees are not easy to find and protected. This one grows in Parramatta in a public park. as tomb stones for their dead. More than 7,500 Aboriginal-scarred trees have been recorded in NSW, but fewer than 100 carved trees remain standing in their original location . The rest has been removed for farming, forestry or development. The number of scarred trees is dwindling and the remaining ones need to be protected. Scarred trees are now fragile reminders of the resource harvesting techniques practised for thousands of years . Where can you find scarred trees? 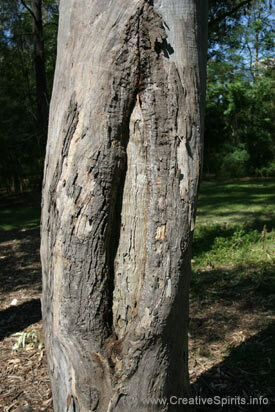 Scarred trees are found wherever there are mature native trees, especially box and red gum. They often occur along major rivers, around lakes and on flood plains, but also at significant (sacred) sites. The scarred tree in the image above stands near the Parramatta River. Lake Boort Reserve, 255km north-west of Melbourne, is Australia's largest scarred tree site with about 900 red gums and black box trees scarred by the Dja Dja Wurrung people. More than 600 stone tools and weapons and about 500 cooking mounds have been found nearby . 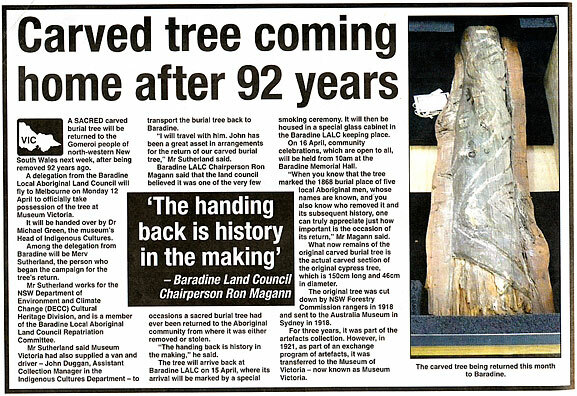 The Keelbundoora Scarred Tree and Heritage Trail offers information and history on scarred trees. It opened in May 2008 at the Royal Melbourne Institute of Technology's Bundoora campus which sits on Wurundjeri Aboriginal land. While scarred trees are protected under state or territory law many are still in danger of being damaged or cut down for firewood or during land clearing. As many of them are also very old they are vulnerable to bush fires. Bush fuel loads need to be kept low within 20 metres of scarred trees to ensure their survival in the event of a bush fire. Vandalism is a constant threat, which is why exact locations of such trees are not revealed publicly. Sacred trees have been burnt and poisoned int the past, some of them shortly after they were approved for heritage listing . You can find scarred trees in Australia even today. Look out for the following characteristics . The Scar is fairly regular in shape, often with parallel sides and slightly pointed or rounded ends. The Scarring usually begins above ground level. Exposed sapwood is free of tree knots or branches or there is evidence of a branch having been at the top of the scar. You may see stone or steel axe cuts at the base and (more rarely) at the top of the scar on the exposed sapwood. Many of these marks are hidden because the bark has since grown back. The scarred tree is an Australian native species which occurs naturally in the area. The Aboriginal scarred tree is usually over 200 years old. The older a scar is the more regrowth covers the exposed sapwood, sometimes covering the scar entirely. Carved trees are a form of visual communication. They mark sites of significance to Aboriginal people such as initiation or burial sites . Tree carvings can be found dotted throughout Australia, but are mainly of NSW origin--specifically the work of Gamilaroi and Wiradjuri artists. Other names include arboglyphs, dendroglyphs and teleteglyphs. For burial sites the trees usually marked the grave of an important man. The design reflected the cultural heroes of this man and provided a pathway for his spirit to return to the sky world. The design faces the burial site to warn passers-by of the spiritual significance. In the early 1900s a few Western people became passionate about documenting and collecting relics, including carved trees. Robert Etheridge wrote "The dendroglyphs or carved trees of New South Wales" in 1918, a first attempt to document Aboriginal tree carvings in NSW, then estimated to number more than 600. Lindsay Black wrote "Burial Trees" in 1941, the first book to ficus on Wiradjuri tree carvings. "The Bora Ground" in 1944 detailed Gamilaroi carved trees. Edmund Milne and Clifton Cappie Towle were among others interested in carved trees. During the 1900s some trees were cut and their carved sections sent to Australian museums. These trees now return to their Aboriginal communities to help the healing process. In 2009 the Museum Victoria returned one of these segments to the Local Aboriginal Land Council in Baradine, 490km north-west of Sydney, after two years of campaigning . The tree had been cut down by rangers in 1918, reduced in size and sent to the Australian Museum in Sydney. Three years later the carved segment was transferred to Museum Victoria. Artists from all over New South Wales are looking at carved trees as inspiration or to revive the practice. For example, Aboriginal artist and Elder Vic Simms carved a tree in the Botanic Gardens in Sydney in 2011. There is no public display of carved trees because most of them are more than 100 years old and very fragile. Also, many collections have not yet entered community consultation for approval. Graham Ballard from Casino, NSW, wrote Gum Tree, a poem reflecting that a tree is so much more than just a tree . As if we weren't so very blessed to have it there. Watch this old film of an Aboriginal man cutting out and then refining a coolamon (a wooden dish used for carrying and digging). How was Aboriginal land ownership lost to invaders?